If you have just walked out after a bleh movie and nothing can get your mood up, but a slice of Tiramisu or maybe a nice filling sandwich, then just go down the road towards DAV school, and voila, you will see this Tea house tucked amidst the row of houses. And for those who have been to Bangalore, and visited Infinitea, you will have hunted around Chennai for a similar place. Well, your search ends right here!! How was Lloyds born? Well, Vandana, a home baker was the one who took it upon herself to bring the idea of a Tea house to Chennai. And then came Pavan, an investment advisor followed by Rashmi, a jewellery designer, Sunny who happens to be the in-house tea connoisseur and finally Rajesh, the one who took hold of the reigns and who also owns a car parts store down the road. And thus was born Lloyds tea House. Why the name? Well, the place is located on Lloyds Road, simple! The interiors and decor is very English, the tables and chairs very casual and comfortable, and a small garden around the place. I have been there more times than I remember, and have had quite a few fond moments as well. Work related meetings, meeting friends for a casual chit chat session, and food meets as well. The place is small, but big enough to seat more than 20 people, they have a nice TV screen that is placed in front of a few sofas, a book shelf with an eclectic collection of books, and shelves lined with tea boxes neatly labelled. Oh and how can I forget the wall to wall shelves at the far end of the room with interesting curio pieces, some of which are interesting looking tea pots. As you settle into the chair, you will see two menus placed in front of you. One is an extensive tea menu while other is the food menu. If you are lost or confused, just ask one of the staff members to help you decide! Their choice is good and you will end up having a lovely time. On the food front, they have quite a range of Sandwiches, pasta, pizza, risotto, finger food such as the Rosti platter, BBQ Chicken, Vol au vents, Roasted vegetable crostini and so much more. 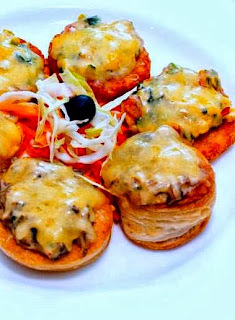 The Vol au vents is quite a nice dish- light fluffly puff pastry with mushroom & cheese on the top. The Rosti platter on the other hand are discs of hash brown with loads of cheese and a nice bite to it. 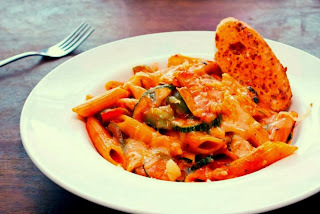 Among the main dishes, I love their cottage cheese pesto sandwich, and their range of vegetarian pastas. The Creamy fusilli with mushroom is a personal favorite. They are sweet enough to custom make pasta on order. The Margharitta pizza that was served was beautiful. 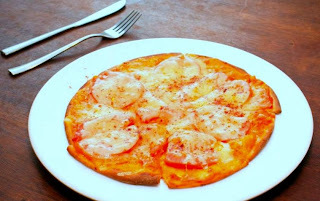 Thin crust base with healthy portions of tomatoes and cheese on top. But if you are not a tomato lover or like something different, just take your pick from their menu. 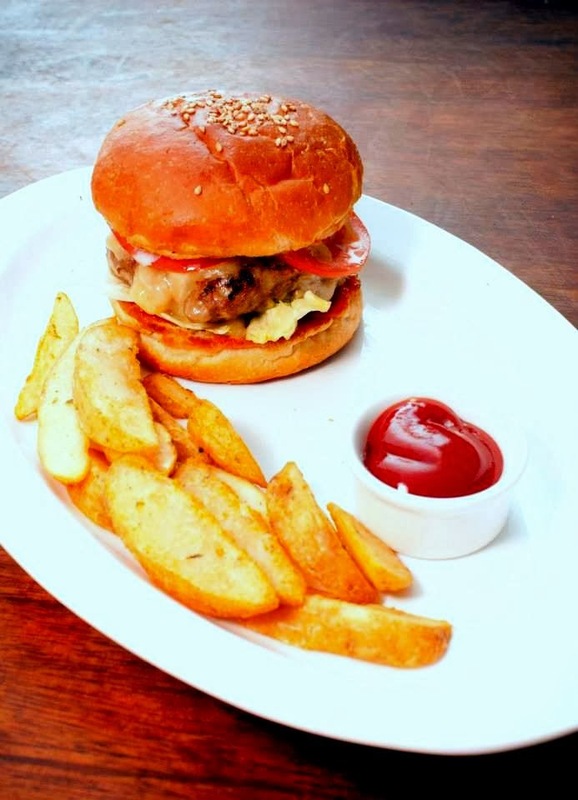 They also have a few burgers, Chicken Cheese burger and a very Cheesy Cheese burger which is simply amazing. We also tried their Thai Basil Cottage Cheese with Rice and Penne Arrabiata Pasta. Both of these had unique flavours, filled with vegetables and were quite filling. The pasta was quite spicy, a tad too much for my taste buds but I washed it down with some peppermint tea..
And just when you think you are done for the day, you notice the dessert counter with the delectable cakes staring at you with inviting glances. 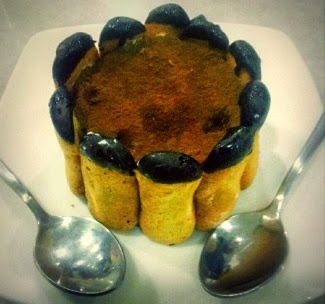 Opt for the almond chocolate sticks or the Tiramisu, you are in for a treat. On that high note is how you end a perfect evening!! Lloyds as I have mentioned above, is a perfect place for a quiet evening with friends, or with a book and also an ideal place to have a business meeting in. And if you have been here few times, the staff know you and will bring your order without a word exchanged!